Nick Adamson placed 4th in the points in 2014 and he vowed that the 2015 season would be a different story. Adamson stayed true to his words by posting winning pulls at the season opener, Pacific Coast Diesel Nationals and at the Big Sky Truckfest. 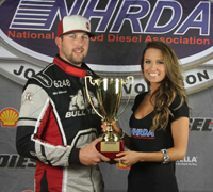 His pull at the World Finals clinched him the 3.0 NHRDA National Points Champion. © 2014-2018 National Hot Rod Diesel Association. All rights reserved. Design By Jex Performance.